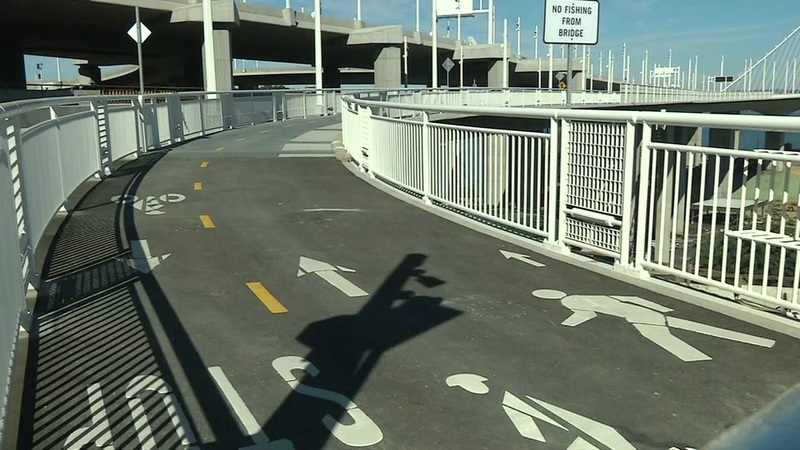 TREASURE ISLAND, Calif. (KGO) -- Caltrans opened the last part of the Bay Bridge bike path on Sunday. The four-and-a-half-mile path on the eastern span will finally go all the way to Yerba Buena Island. But, riders and walkers won't be able to just zip down to Treasure Island. They'll need to take a shuttle because the roads on Yerba Buena Island are not considered safe for cyclists and pedestrians. For a complete list of hours, click here. Meanwhile, the on and off-ramps to Treasure Island opened to drivers for the first time Saturday. It's part of a planned expansion as crews get ready to build 8,000 new homes on the island. The big difference for drivers coming toward the city is the exit for Treasure Island and Yerba Buena Island is now on the right side of the Bay Bridge, instead of the far left. Once drivers exit, they can turn right to head to Treasure Island, or left to get to the Coast Guard facilities on Yerba Buena Island. Drivers leaving the island and going back toward the city will now have an easier time merging with traffic. There is a longer acceleration ramp that will make for a smoother merge. The reason for the new ramps is really for safety. Transpiration officials say the tight turns and quick merges were challenging for drivers. The project cost $98 million. There are no changes for drivers coming here from the city.